This makes a great side dish or a perfect appetizer served with Crostini bread or crackers. 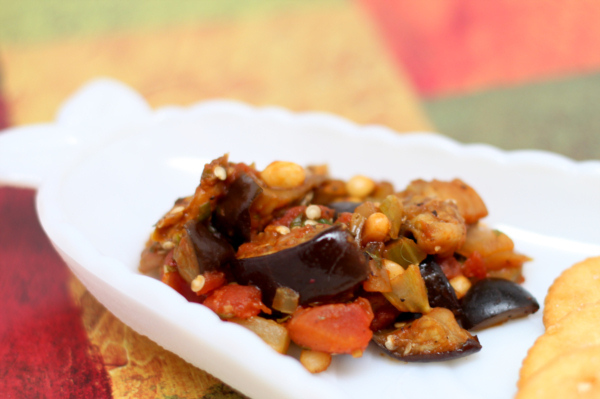 Every caponata you find is a little different – there are so many components that it is easy to get different versions. This one uses very little oil and is my absolute favorite. By pre-cooking the eggplant in the oven, you use much less oil and you won’t even miss it ! It has all my favorite things and has a great depth of flavor. To toast pine nuts, sauté in a hot, dry skillet for a few moments – until golden and aromatic. Place eggplant cubes in a colander over a bowl and sprinkle with ½ t salt. Mix well so that all eggplant is salted. Then place a small plate or bowl on top of the eggplant and weight it by placed a canned product or some other heavy object. The salt and the weight will draw some of the bitter liquid from the eggplant and you will end up with a much sweeter tasting caponata. Let sit for an hour then rinse eggplant and pat dry. Heat oven to 400 degrees. Spray a baking sheet with Pam, and place eggplant on sheet in a single layer. Cook for 20 minutes then remove from oven and set aside. Heat a skillet and add 2 t of oil. Also spray with a bit of pan and then sauté onions and celery on medium high heat until partially softened, about 10 minutes. Add garlic and sauté a minute longer. Add ½ c water and continue cooking another 10 minutes. If the mix gets dry, add up to ¼ c more water to keep it moist. Add tomatoes and their juice, tomato paste and olives and cook on medium for 10 minutes until sauce thickens a bit. Add eggplant, vinegar, salt, pepper and cocoa and cook on low for 15 minutes. Remove from heat and stir in toasted nuts and 2 t oil. Serve room temperature or chilled. 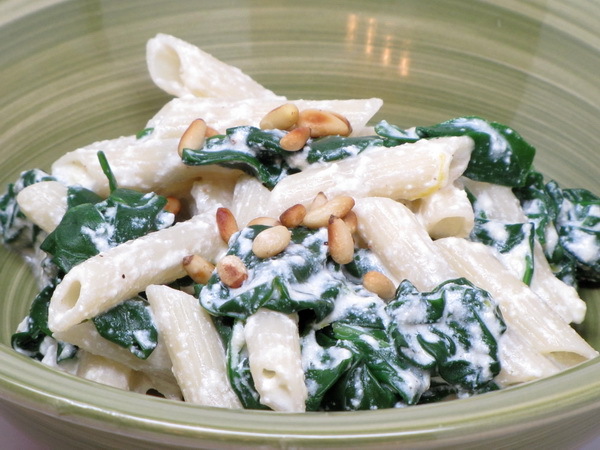 This is a great ‘white pasta’ dish – the ricotta, parmesan, spinach and garlic just work so well together. And when you add in the toasted pine nuts, the flavor meter goes off the charts. You definitely have to try this one !! Cook pasta according to package instructions adding frozen spinach to the water the last 2 minutes. If using fresh spinach, put spinach in colander and drain pasta over it. Put pasta in bowl with spinach and stir in cheeses, lemon, salt and pepper. Plate and add pine nut garnish. This has sooooo much flavor in it that you just want to keep eating and eating ! It was just a perfect mix of ingredients and makes a great lunch serving. Brush mushrooms and squash with oil and 2 T of the dressing, Grill or broil 3-4 minutes each side and then cut mushrooms into slices. 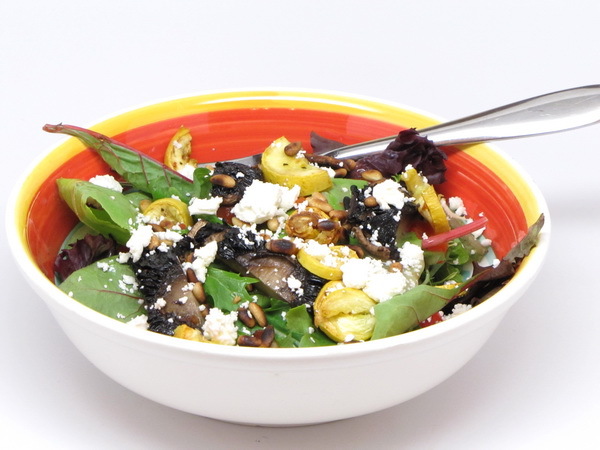 Add mushrooms and squash to lettuce and peppers. Add the rest of the dressing and toss to coat. Sprinkle with cheese and nuts and serve immediately. 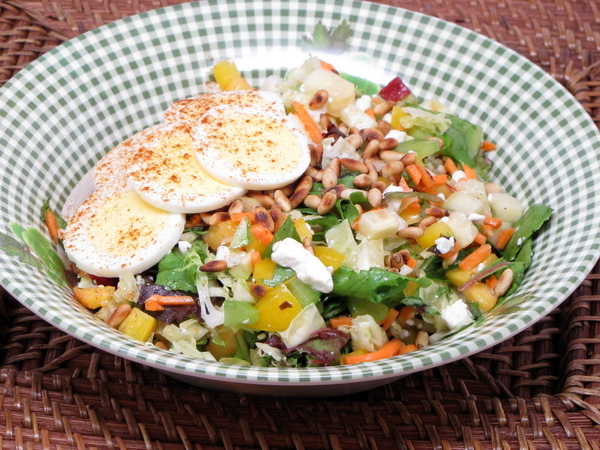 The idea of a chopped salad is to get all the ingredients chopped uniformly and small – otherwise, it is just not a chopped salad ! And to me, prepping things in this fashion DOES make a difference in the flavor of the salad. There is something about getting a bunch of the ingredients in your mouth at the same time – it just makes for a flavor explosion ! Mix together all the veggies with oil and vinegar. Season with salt and pepper and then add in cheese and almonds. Top with eggs and sprinkle with paprika. To toast the almonds, simply place in a hot skillet and sauté until toasty and starting to brown.